Winter is the perfect time to round up your most timeless wardrobe pieces and bring some chic to the streets. New York street-goers are one step ahead as usual as they utilize one of the most classic trends of the season—the camel coat. To maintain that laid-back style we all love, it seems as though black and denim are the best pairings for your soft outerwear. A cozy black turtleneck will keep your street look effortlessly on trend and it will make the creamy, soft color of your coat really pop. A casual but well tailored jean or the ever popular denim shirt round out this minimalistic yet elegant aesthetic. For an understatedly chic way to amp up your ensemble, opt for classic black leather add-ons like a compact purse, edgy booties, or sleek trousers for a day-to-night appropriate outfit. 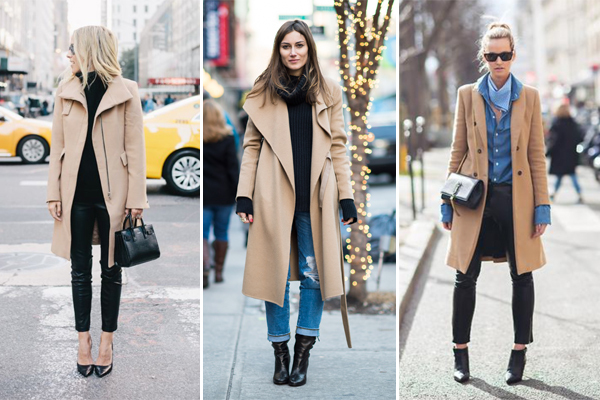 Are you up to date on the camel coat trend? You can also leave me a message then tell me your favorite look!